I love going to new places but traveling (specifically flying) really stresses me out and I have terrible travel anxiety. I have to be really mindful of my anxiety or it can get completely out of control. I recently flew by myself from Florida to California. The flying part was incredibly stressful but I had a great time and I’m so glad I didn’t let my anxiety prevent me from having new experiences. 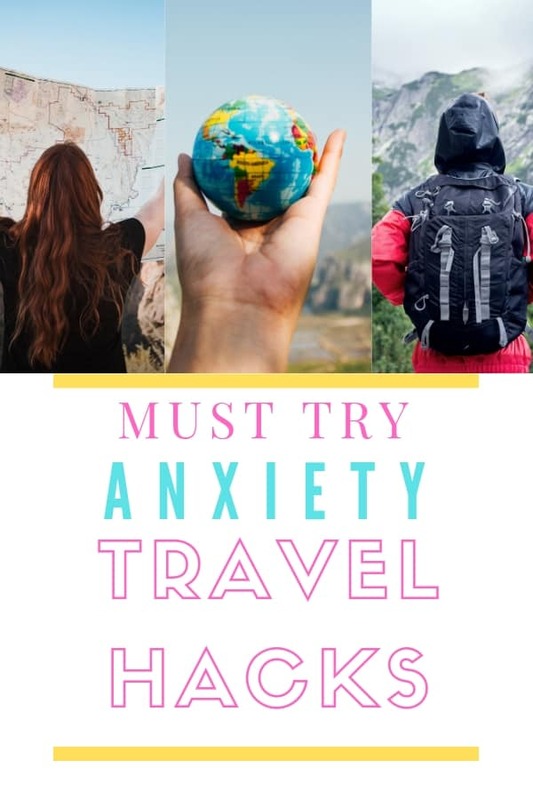 Here are my tips for traveling and flying with anxiety, if you have anxiety be sure to check out my other posts about anxiety. My mind loves to do a worry loop where I obsess over the same thoughts over and over. To break the loop I write what I’m worried about in my journal. After I write down my fear I cross it out and I write out all the reasons that I don’t need to worry about that thing. This helps me be aware when I start to enter a worry loop and it helps me break out of it when it starts. If I’m not writing my way out of a negative feedback loop I will just write gratitude lists or make a list of things to do. If you’re interested in using journal prompts I have a post of anxiety journal prompts you can check out here or you can drop your email below to get my free anxiety journal. Create a playlist of your favorite music and zone out. I like to listen to pop music because I think it is a good distraction but you could also make a relaxing playlist. Music helps me get out of my head and is a great distraction when I’m walking around the airport. If music isn’t your thing try an audiobook, I love listening to audiobooks while I’m traveling. Use this link to get 30 days of unlimited audiobooks for free. If you need some book recommendations to check out this post. Podcasts can also be a good distraction if you want something shorter than an audiobook. Part of traveling is that something is always going to go wrong but planning ahead can help your day go a little smoother. I like to get to the airport really early so I don’t have to rush or be stressed going through security. Make sure you know how to get to the airport and where you will go when you land. Get any details taken care of ahead of time to make your travel day a little less stressful. It’s also a good idea to make a plan in case your anxiety starts to get really bad. Knowing how you will handle your anxiety can help you feel prepared and less worried about getting anxious. I have a post about breathing exercises that I use to manage anxiety that can help you calm down when you start getting anxious. I also bring my essential oils when I travel. Essential oils can help you calm down when you’re getting anxious. and you can get that at any health food store. I like keeping essential oils in my purse and I use them as soon as I start getting nervous (basically as soon as I leave for the airport). I don’t want to let my anxiety shrink my life and make me miss out on experiences. Even though I get really bad anxiety I still travel regularly. Find a mantra or an affirmation that makes you feel like a badass and repeat it over and over in your head. Remember why you are choosing to travel and what you will get out of the experience. I have a post of affirmations for anxiety here. My biggest tip is to practice grounding techniques BEFORE you feel anxious. Grounding just means you bring your awareness back to the present moment and back to your body. If you practice grounding yourself throughout the day when you’re not anxious it will be easier to do when you’re feeling overwhelmed and need to calm down. You can find all of my favorite grounding techniques here. When I travel I usually keep a small crystal in my pocket and will squeeze it in my fingers when I start to feel anxiety creeping in. I bring my focus fully onto the feeling of the stone between my fingers and anchor myself into the present moment. Having a meditation practice has also really helped me learn how to ground myself and to be present instead of letting my mind wander and worry. When I was younger my anxiety and panic attacks got completely out of control. It really started to limit my life and I found myself avoiding more and more situations. I realized if I didn’t do something my reality would continue to shrink and I would no longer be able to go to busy social events or travel at all. I found a great therapist that specialized in panic attacks and he was able to help me learn to cope with them. Now years later I still have anxiety but panic attacks are rare. I’m so glad I reached out and found someone that was able to help me learn how to deal with my anxiety before it got even worse. If you’re struggling with anxiety or you find yourself avoiding certain situations to try and control your anxiety I hope you will consider seeing a therapist. I recommend researching and finding someone to talk to that specializes in anxiety. I hope these tips help you. 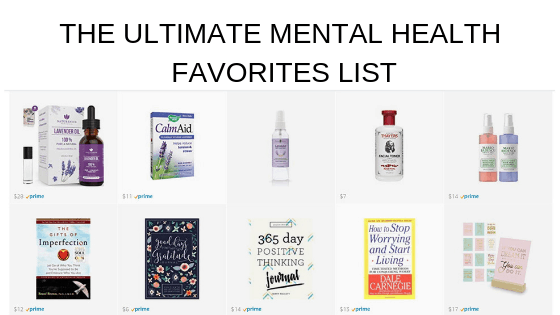 Be sure to check out my post on putting together your own anxiety coping kit here. 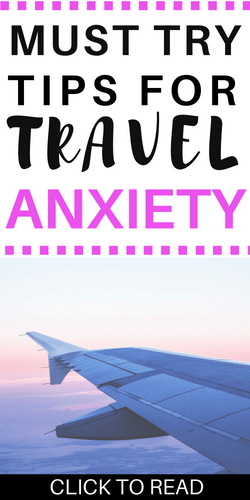 I know how hard it is to travel when you have anxiety. There have been tons of times where I wanted to pick staying home in my comfort zone instead of dragging myself back to the airport. However, every time I travel I am so glad I went and I didn’t let my travel anxiety stop me. Traveling gives you access to so many new experiences and being out of my environment always makes me feel more creative and inspired. In fact, I got inspired to start this blog while I was backpacking in Europe. You never know what kind of adventures and experiences are waiting for you! Want to remember these tips? Save this article to your favorite Pinterest board!